Two maps show this road in the Eastern Cape as "unpaved"
VEHICLE: There might be a lot of romance surrounding the idea of doing a safari in Africa in your own private 4x4 but in truth, for the first-time visitor, about 98% of the places you might want to go are accessible by normal old, much-less-expensive sedans or station wagons with only 2 wheel drive. We have done over 25,000 miles (40,000 km) of driving in such cars as a Morris Minor, a Peugeot station wagon and an Audi sedan. The roads in South Africa are generally top class, and even in the neighboring countries where the roads might be gravel or dirt, they are still easily and safely traveled in a 2 wheel drive car. Potholes are more of a worry than getting stuck, and we talk more about that road hazard below. That being said, if you're bitten with the 4X4 bug and it won't let go, you can rent awesome camping vehicles from a number of reputable companies throughout greater southern Africa. One of the best and with a huge selection of vehicles is Camper Travel Africa. The downside to a 4X4 is fuel mileage. With the BIG distances to cover that can add up fast. 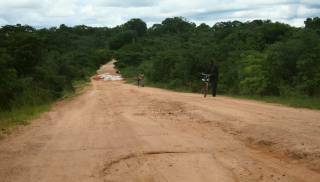 We will confess to sometimes wishing we had a 4X4 especially when seeing dirt roads winding deeper into Chobe National Park. The upside of these camper vehicles is that they sometimes come equipped for the bush: roof top tents so 2‑4 people can sleep on mattresses off the ground, with no tent to erect at night and no accommodation to find or pay for. Most have cooking gear as well and sometimes even a small fridge, so you can be truly self sufficient. Cost‑wise you'll pay about $130‑180/day to rent an equipped 4X4, as opposed to about $30/day for a smaller, economical car with lots better fuel mileage. SPEED LIMITS: Almost all of the open highway driving in southern Africa is posted at 120 kph (73 mph). The roads only sometimes warrant such speeds. South Africa's "N" (for National) highway system, the new Trans-Kalahari road from Botswana to Namibia, and main road north in Namibia are also good roads. Elsewhere it's a mixed bag. Near the urban centers the national roads become divided toll roads. The farther you get from humanity the narrower the roads until you're on a 2-lane, opposing traffic, no divider road, such as north of Polokwane on the N1. And it's still a toll road and still posted 120 kph! The N2 south of Swaziland curves through villages with reduced speeds and the ubiquitous speed traps. "Speed trapping" is an effective African police income producer - it's not apparent whether it reduces speeds. On the main highways there are cameras and they'll mail you the ticket later (no warning signs beforehand, as Australia has). But the more personal approach is a group of police by the road with one radar gun. If you see oncoming traffic flashing their headlights at you, that means there's a speed trap ahead. The more huts you see on the hillsides, the lower the speed limits will get. ROADS: If a map shows a road as 4WD‑Only, believe it. 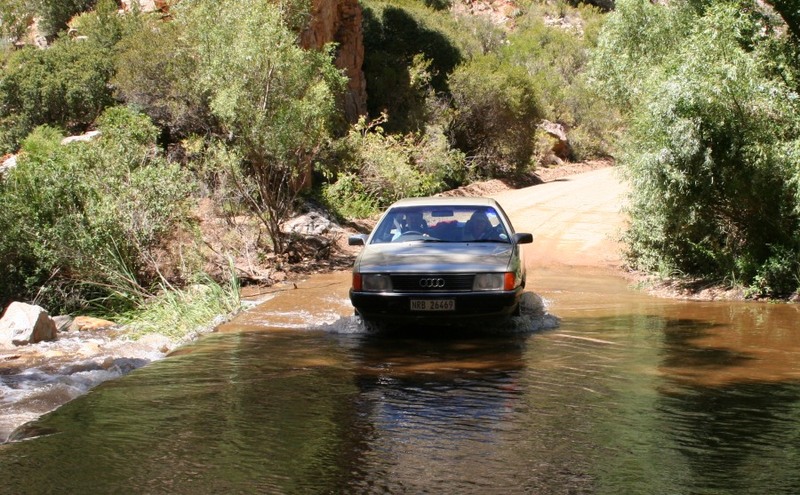 Otherwise, most dirt (or graveled) roads in southern Africa are quite passable in a 2WD such as our low-slung Audi sedan. Indeed, most will support 60 mph (100 kph) speeds. 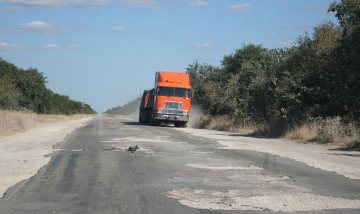 All graveled roads in Kruger Park are well graded (but the speed limit is 40 kph). Other game parks will post 4WD-Only signs where needed. The original "strip" roads of Africa are gradually disappearing but they can still be found. These are roads with only 2 strips of paving, usually concrete. You drive with your wheels on the paving until a car approaches (doing the same thing). To pass, you each drop one set of wheels off the paving onto the verge. (Remember to move left!) Some roads marked by a narrow solid line on the maps are only as wide as 1 car. The same driving technique applies. The better roads have wide, firm, sometimes paved verges (shoulders). It is legal to drive on these, or with one wheel on them when being passed. A truck bumper saying "Illegal to Yellow Line" means they are not allowed to drop a wheel onto the verge. Passing them will be harder. Most motorists are very courteous about allowing others to pass. Many smaller roads save money by using "drifts" instead of bridges. These are simply dips in the road which cross a (usually dry) waterway. Many will have small concrete markers on the sides to judge water depth. Obeying the signs to only cross when the markers are visible is a good idea. There are always people on the roads, so be careful! ROAD HAZARDS: Potholes are a major problem everywhere except on South Africa's "N" system roads. Potholes and corrugations on dirt roads are expected. 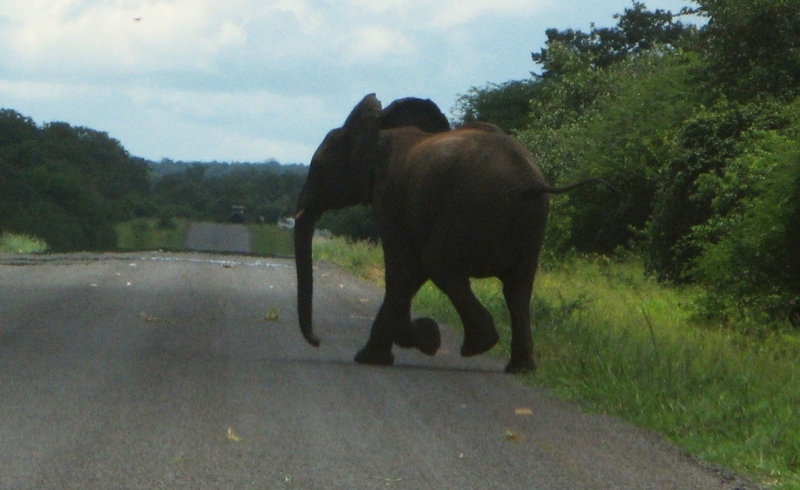 But potholes that could hide an elephant on national paved roads are a fearsome hazard when you're doing 120 kph. Sometimes the road crews have put out "Potholes Ahead!" signs. These could refer to holes within 100 meters or 5 kilometers or more. Badly potholed roads (such as within 150 km of Nata, Botswana, and north of Livingstone, Zambia) can have you crawling at 10-20 kph. The higher your vehicle the easier it is to see the holes ahead of time but at much more than 100 kph it's tough. On a non‑shouldered road (where the bush comes to the edge of the pavement) you know there are bad holes when the road suddenly widens to include short dirt verges or long black skid marks, both caused by big trucks. Animals come in bunches, herds, flocks, or individually. Very few roads are fenced and some antelope, like Kudu and Eland, will jump a 9' (3m) fence. They are most dangerous outside the designated game parks because you're not expecting them, but they are there! They come in all levels of intelligence. On the public roads, smartest are the goats, who, even if a herd is crossing the road, will jump away as you approach (but do it slowly!). A horn helps alert them. Cows tend to clump together and try to all cross at once. You often need a full stop to let them pass. Dumbest are the donkeys. In rural areas they are left to graze by the road. They don't respond to horns or near misses. They will stand and stare at you as you pass within 2 inches of their heads. Beware a potential kick from an irritated donkey (or zebra, for that matter!) Some ostrich are stupid enough to actually run in front of you. Small doves and other birds will often stay in the road until they are almost under your wheels, which is very disconcerting but rarely results in a collision. 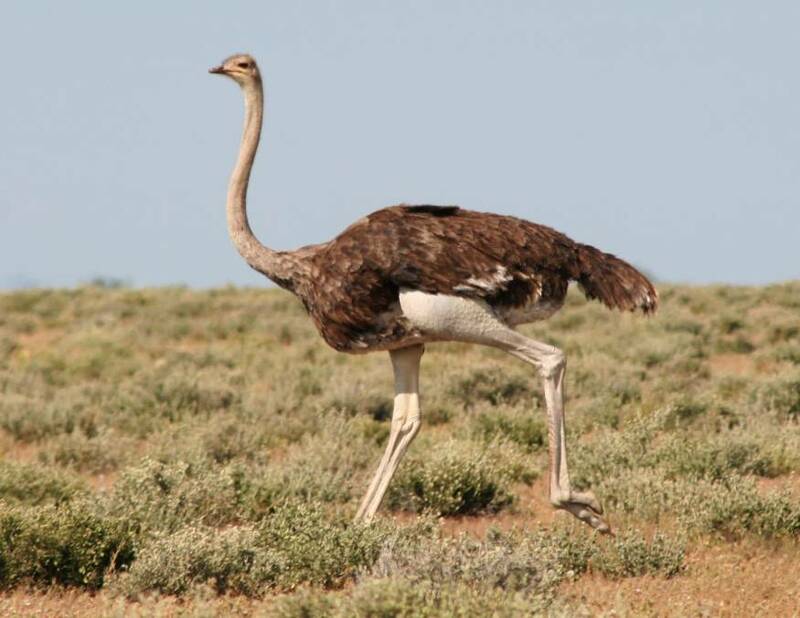 In Botswana, Namibia and Zimbabwe you might encounter anything, but mostly wild ostriches, warthogs, and elephants. They don't obey road signs. They can be anywhere. Elephants, of course, have right of way. Do everything possible to avoid driving at dusk and dawn (except in game parks) and at night. The African road hazards become killers when they can't be seen. CONVENIENCES: Meaning food and toilet stops. 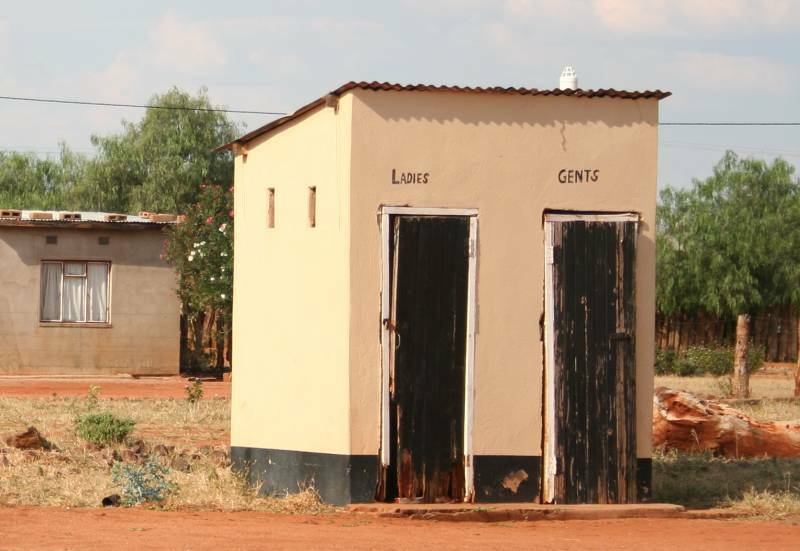 Most major petrol stations have toilets in varying degrees of sanitation. On the open road it's best to find a verge and pull off. Picnic places (marked in most of the southern African countries by a sign with a tree and a table) can be lovely with shade and table, or trashed out, or occupied by 20 locals enjoying the shade. Sometimes for a picnic lunch you need to just pull into a dirt road and stop. Petrol stations also have 7-11 type convenience stores with delicious $1 meat pies, cool drinks etc. Some have small restaurants, but this is rare outside the South African N system highways. INCONVENIENCES: Police checks are random and commonplace. A downward waving hand or arm by a uniformed person usually means "pull over". A vague flapping of the hand might mean "carry on." Prudence says it's best to slow enough to verify which message they're sending! Sometimes they want to see a driver's license and that you're wearing seat belts. Agricultural checks (for fresh meat and dairy products, usually) are common in Botswana, where they have a major problem with Foot and Mouth Disease. They also have you drive through "dips" and get out and walk on squishy old blankets soaked in something that kills the germs. You may be asked to take all your shoes from the boot (trunk) to press on the blanket as well. This can happen twice within 5 kilometers. Patience and a smile help. Safety: Back in early to mid-2008 Mugabe sent his henchmen into the (mostly Matabele) areas that voted against him, so travel was, once again, unsafe in Zimbabwe. It's always good to check the current political situation before driving into any African country. That being said, you can maximize your personal safety while traveling in southern Africa the same as you would at home, with a few more precautions. If you drive at night (not recommended) be sure to keep your windows up and doors locked, especially at cross-roads and stop-lights. South Africa especially has a major problem with car hijackings. In deserted-looking areas, slow down for road crossings, but don't sit like a duck at red traffic lights when there is no other traffic -- carry on through. Most car‑jackings happen at intersections at night, although sadly, some happen in broad daylight. When you stop at petrol stations, don't casually get out and leave your car keys in the ignition, nor leave young or elderly people alone in the car unless it is locked. Always know who is around you before alighting from or returning to your car. You will hear stories (probably true) of how it seems like everyone in South Africa knows someone who has been shot. Crime is a major problem in this part of the world, but it VERY RARELY affects the tourists, other than purse/bag snatching or ATM scams. The people most at risk of violent crime are women walking alone, or owners of small shops with cash on hand. Don't venture into parts of cities that you're warned not to go to, especially in the larger cities. If you stick to the big roads and sign‑posted routes you'll have no need to stop. If you DO have car trouble and have to pull over in an unsavory area, use your cell phone to call for help. (Always know the equivalent of 911 for the country you're in.) Keep your doors locked until help (in a marked vehicle) arrives. If you must walk from your vehicle, lock it up, take your valuables, and all leave together. (This is a last resort, as you may return to find not much in your car!) Sad to say, the bad guys sometimes lure you into stopping by simulating an accident or break‑down, so now fewer folks stop to help stranded motorists. BORDER CROSSINGS: Not one African border crossing we came to had signs telling us where we were to drive, park, or go. So just meander into the parking area, park, lock, and all of you go inside the nearest building. If it's the wrong one, someone will probably tell you. Immigration is invariably first. They need to see all the bodies associated with the passports (no leaving grandpa in the car to snooze). Usually there are entry/exit forms to fill out. We collected extras to fill out ahead of time for the next crossing into/out of each country. The best times to cross borders is early morning. Some of the maps give border post times, but usually 8AM is a safe bet. By mid-morning and later the lines (well, people-jams) can be long. Exiting is always faster than entering. After immigration the next counter is customs which deals with the car, the driver, the registration numbers. Botswana and Namibia have reciprocal third party liability with South Africa, but in Zimbabwe and Zambia you have to buy 30‑day insurance (for about US$20). This insurance purchase often involves another small office but usually no lines. You are given a "gate pass" (slip of paper) that all the relevant authorities must stamp and which must be relinquished before you're allowed out the gate into the new country. Driving someone else's car is not a problem as long as you have the registration papers and a police-authorized, signed letter saying you have permission to take the car over certain borders. Rental companies will supply you with all the needed paperwork. 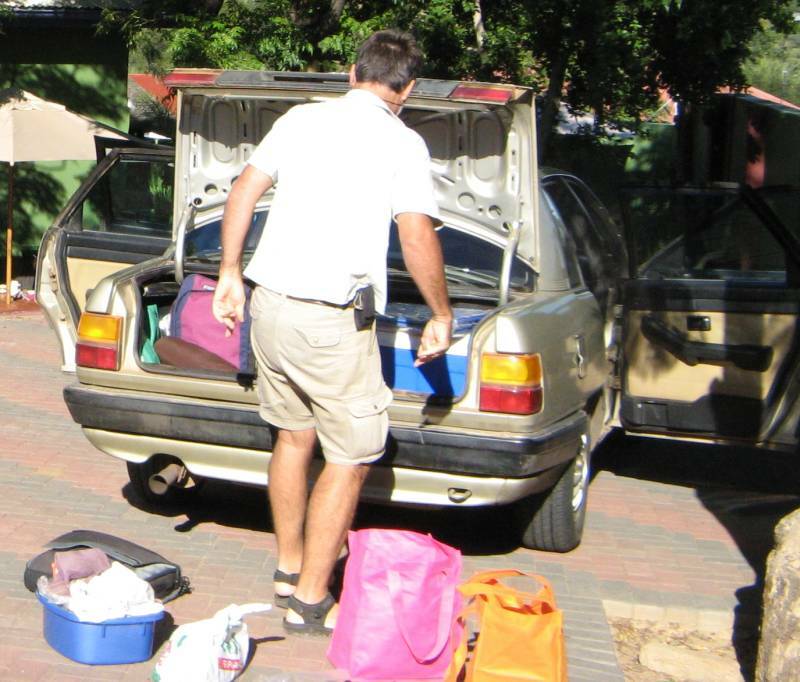 COSTS: In 3 months of road trips, we tended to average about US$100/day total for a family of 4. This included fuel (about $1/liter, and the main expense when we traveled far during the day), park entrance fees, lodging (about $10‑30/night for the 4 of us - the girls often camped in their tent, but other times we all slept in one hut or room) and meals. Breakfasts ran about $2 each self‑catered, lunch about $2 each (usually a picnic), and dinner about $7 each. We hear from other travelers in 2011 that prices are still about the same! Petrol prices vary by distance from major ports but will all be the same price within a given area, set by the government. Farther inland the prices are higher. The exception (as of this writing) is Botswana, which generally has lower prices than South Africa, as does Swaziland. Shell is the best (and often the only station) for accepting credit cards for payment. We got 10 km/liter (22.5 mpg) so we did the math ahead of the trip to be sure we had enough cash. Fuel was generally NOT available in Zimbabwe in 2008, but is better in 2009. Carry jerry‑jugs with enough to get you completely through Zimbabwe if you go in. Sometimes you can buy fuel with "For-Ex" (foreign currency) but don't count on it. 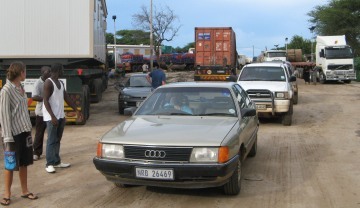 Any station with fuel in Zimbabwe is likely to have 300 cars all jammed in trying to buy it. [NOTE: That was the case in Zimbabwe as of May 2008. In July 2009 we hear it's available, for about US$1.25/liter.] Botswana and Swaziland were the only countries where we could use a credit card for fuel. South Africa (and Namibia) required a special "fuel card" which we never got. ACCOMMODATION and SELF-CATERING: The "backpacker" phenomenon is only in the touristy routes of South Africa and places like Windhoek and Tsumeb (Namibia) and Livingstone (Zambia). A true backpacker accommodation has camping sites ($8‑10/person), a variety of rooms ($20‑30/double) or huts with/without private toilets/showers. The main thing is that they all have full kitchens: fridges, stoves, ovens, pots, dishes etc. You just bring food. Towns with no backpacker places have "guest houses" which are more expensive ($50+ per unit with additional charges per extra person) and also have small kitchens. In game parks the cheapest huts have fridges and BBQ areas but no cooking facilities. If you camp or have a hut you get a braai pit, sinks and taps. Usually no tables (except in the huts). No "kitchen stuff" like pots and pans. Power points for charging camera batteries, razors, computers are available in huts and sometimes if you camp. You have to buy or bring wood/charcoal. Parks have small shops with food basics, but it's expensive. Better to buy outside. 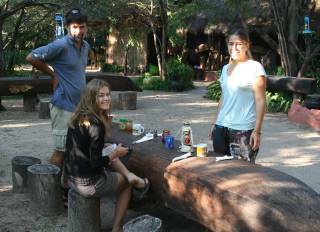 Meals in Kruger at the kiosk are about $4‑6 and quality varies but they were usually adequate. The buffet was about $16 for special occasions (and when you're hungry). As yachties, we drank tap water everywhere unless it was labeled not to. We even drank (safely) from the Okavango Delta! GUIDE BOOKS: Lonely Planet is the best there is and while it is pretty inaccurate outside South Africa it still gives you places to start looking for accommodation. Always call first -- some places are no longer open, or no longer have camping/backpacker facilities. Prices are generally higher than in the books. "Coast to Coast" is a valuable free book describing the backpacker places on the main South African routes. This was our favorite, given out at all the backpacker places. "Where To Stay" is a great free Namibia Travel Guide with listings of park accommodation, guest houses, camping places and lodges mainly in Namibia. You will definitely want reference books for birds, mammals, and general wildlife. We used Beat About the Bush: Birds and Beat About the Bush: Mammals and thought they were excellent. They both include lots of information about behavior, not just identifying the animals. (The combination book, Beat About the Bush: Mammals & Birds , is rather condensed.) All 3 books are by Trevor Carnaby. COMMUNICATIONS and ELECTRONICS: Cell phone SIMs can be bought for South Africa's neighboring countries with the exception of Zimbabwe which doesn't offer pre‑paid. You may need a large town to find the SIM (eg Francistown, Windhoek, etc) but recharge cards are usually available at the tiniest little shops in villages. Set your camera to lower than normal resolution to increase your photo capacity, or take a small computer to download photos each day (especially after days in game parks!). Try to keep the computer locked in the boot, out of sight in shopping centers, at borders, etc. Recharge camera and computer batteries nightly, or stock up on alkaline batteries as needed in bigger towns. MONEY: If you're starting in South Africa, take LOTS of Rand with you. It's good everywhere. We had R3000 (US$375) for a 3 week trip and ran out. It's interchangeable 1:1 with Namibian Dollars and Swazi Lilangeni. The exchange rate with Botswana's Pula varies, and often the Pula is stronger. Zimbabwe as of 2008 was a joke at over Z$2,000,000/US$, then over a billion. By mid-2009, they were accepting Rand or Dollars only in Zimbabwe. We found ATMs in the larger towns in Botswana (but not near Seronga, in the north from where we took the Okavango Delta Trip), Windhoek, and Lusaka (Zambia). Avoid them in Zimbabwe as they'll only give you the official rate, much lower than the market rate. ATM's are all over South Africa. Just be careful to be alone while using one, and never accept help from anyone, especially if the machine appears to be stuck. It is undoubtedly rigged, and you could lose your card, pin number, and money! (Happened to us in 1998!) We used credit cards at the big game parks in South Africa and Namibia, but never in Zimbabwe. 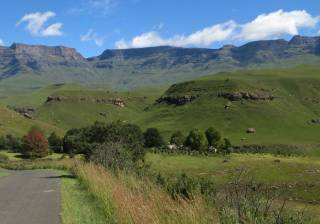 On the road in the Drakensberg. Gorgeous! Our FAVORITE ROUTES in South Africa and over the border: Excluding game parks or National Parks, (which are always favorites!) these are just a few the the most fantastically scenic roads, not to be missed: NW of Cape Town the Cedarberg, especially in spring for the Namaqualand daisies. 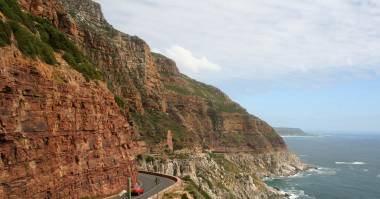 Cape Town area: all of Cape Point, Chapman's Peak Drive, the coast road to Hermanus. 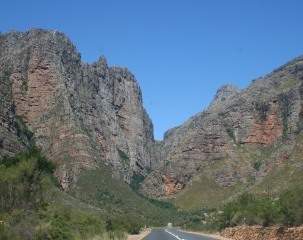 On the N1 out of Cape Town, the De Toits Kloof Pass old road (don't go through the tunnel). All of Route 62 towards Oudtshoorn, with a detour over the magnificent Swartberg Pass. Route 56 Elliot to Matatiele (south of Drakensburg) and all the roads into the Drakensburg like Underberg, Giant's Castle, Royal Natal National Parks. 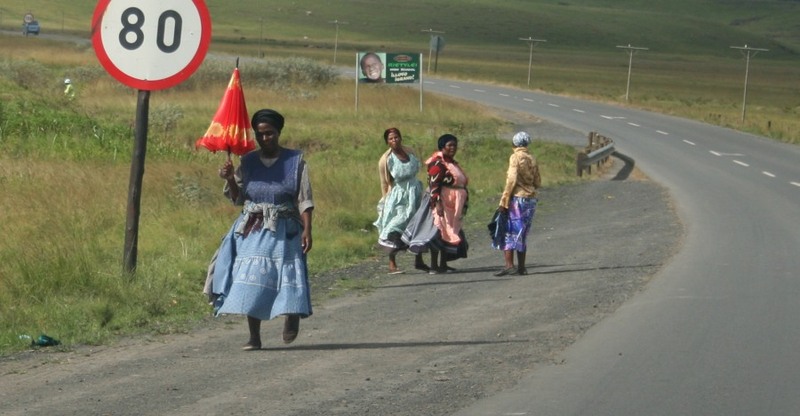 In the Eastern Cape, the road from Umtata to Port St. John's and north. In Swaziland, the road from Mbabane north to Piggs Peak. 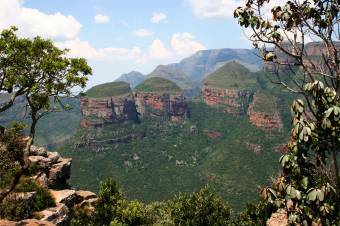 West of Kruger the whole Sabie, Graskop, Blyde River Canyon area. Starting in Richards Bay, or Durban (where many international cruisers base themselves) 2 weeks is enough time to enjoy an easy drive south to the Cape, hitting the coastal attractions on the way south, and inland on the way north, with a jump into Lesotho. We didn't drive it, but cruisers say the whole of northern, western and southern Lesotho are awesome. The eastern roads in Lesotho are 4X4 only, and undoubtedly magnificent if you have the right vehicle. From Cape Town there's lots to explore locally, and then take the time to go north into Namibia for some awesome desert! Namibia has fantastic scenery: sand, red mountains, canyons. Zimbabwe's Victoria Falls is awesome, as are the Eastern Highlands and the national parks along the Zambezi River in the north. 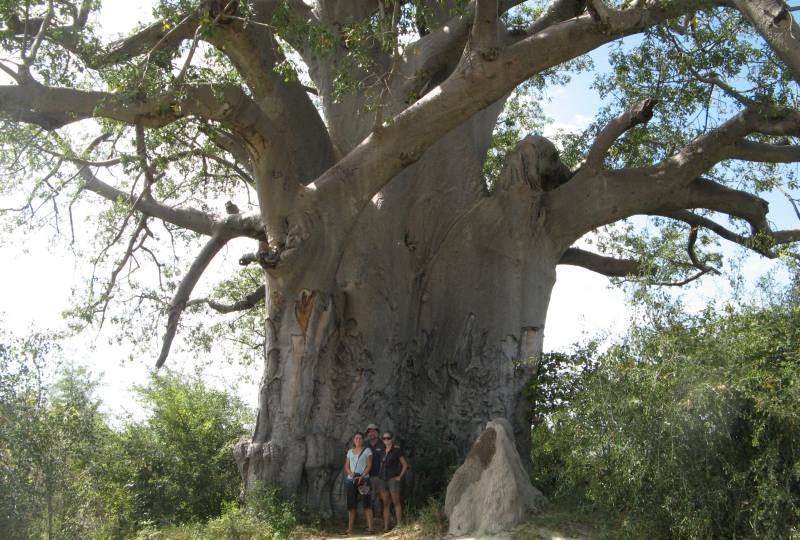 Actually, most of southern Africa is a visual paradise! 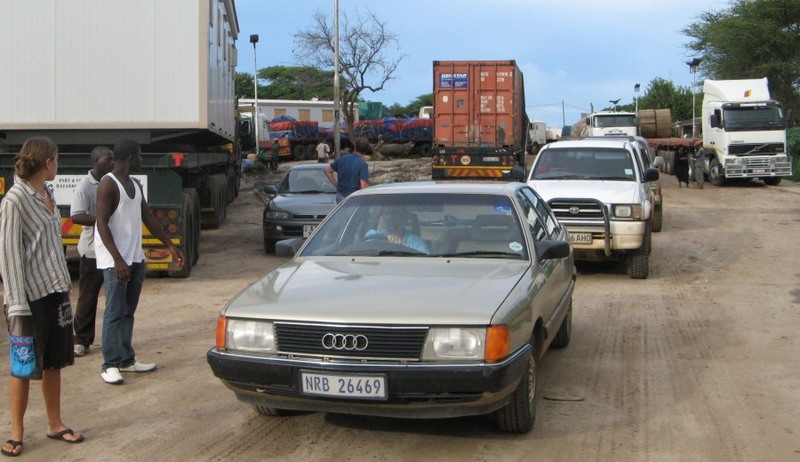 Over The Border: It is possible to drive out of South Africa into neighboring countries and back again in 3‑4 weeks, especially if you're based out of Durban. Distances increase greatly if you are trying to do a round trip out of Cape Town. Obviously, the less time you have, the more hectic the driving! Distances in Africa are LONG and the roads aren't always so great! BTW: most car/camper rental companies provide you with all the paperwork you need to cross borders, at least as far as Botswana, Swaziland, Namibia, and Lesotho. Details below assume a starting point in Durban or farther south, driving a great loop counter‑clockwise heading up the coast (detour into the Drakensburg), through Swaziland, and back into South Africa and the Kruger Park. 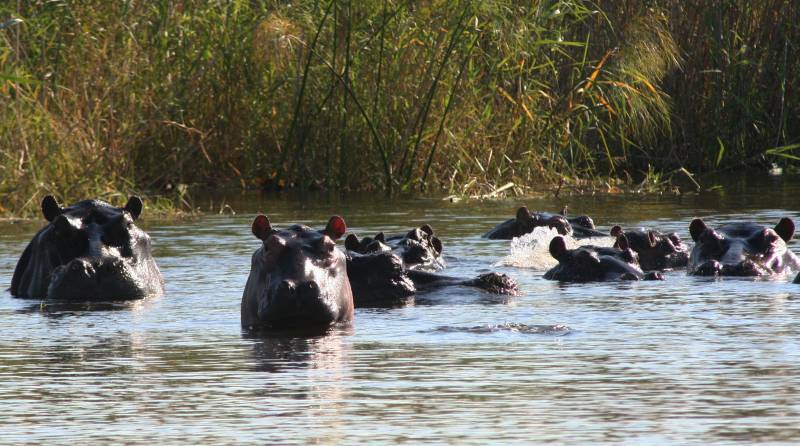 We suggested this itinerary for cruisers who wanted ideas on how to carry on from Kruger. We directed them across to Botswana, then north to the border to dip into Zimbabwe to see Victoria Falls for a day or two. 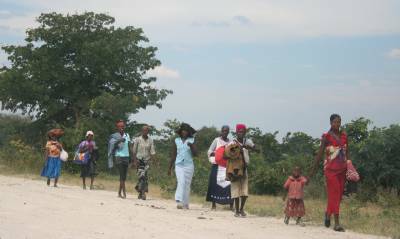 (When we took this trip in April 2008, it was not a great idea to try and go touring in Zimbabwe: there was social unrest, very little food in the stores, and no petrol to be had.) Border crossings get a bit crazy up in that corner as you go from Zimbabwe back into Botswana, then across border into Namibia on the Caprivi Strip. To get to the northern Okavango Delta which is in Botswana, you have to go out of NE Botswana into Namibia and back into Botswana farther west. We recommended the northern Delta because that's where the makoro trips on the Delta are affordable! After the paddle on the Delta, you cross back into Namibia and west to Etosha National Park, south to Windhoek and parts of the Namib Desert, returning to South Africa after seeing southern Namibia or the Kgaligadi National Park on the border with southern Botswana. In 2008 we took the loop the other way, clockwise, starting in the south with Maun and across to Windhoek, then north to Etosha and east o the Caprivi Strip to the Okavango, then to Chobe National Park, Victoria Falls, and south again into Botswana and South Africa. NOTE: To really understand the places/routes we're writing about here, it's best to have a good road map of greater southern Africa in hand. Then you'll understand the convoluted path we had to take in and out of Botswana and Namibia to enter the northern end of the Okavango Delta. Drive slow! Don't let baboons make a monkey of you! Our family took a several different routes, such as across Botswana thru Maun to Windhoek, Namibia, then north to the Etosha, east to the Caprivi Strip, south to the Okavango, back into Namibia and east to NE Botswana and Chobe National Park, across to Victoria Falls, Zimbabwe for a day, then south to Francistown, and back into South Africa. Kruger can be added at either the beginning or end of such a trip. We preferred not to tie ourselves to pre‑paid accommodation much more than a week or two in the future, as, after all, TIA. This Is Africa! We did that in 3 weeks. Lots of driving! Our January trip made a loop (starting in Richards Bay) up to Beitbridge on the South Africa/Zimbabwe border, north to Harare, over the border to Zambia, down to the Zambezi to see Victoria Falls from the Zambian side, then over the border from Zambia to Botswana and south to South Africa. That trip took 1 month. 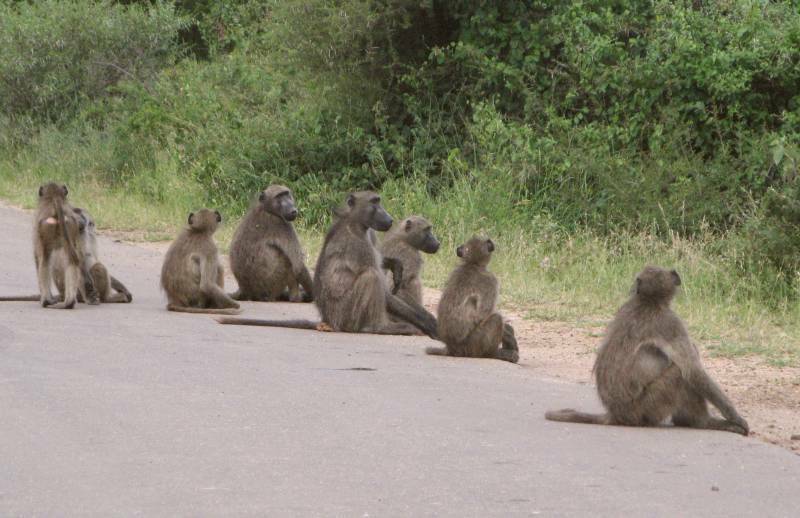 Kruger National Park: A national park as large as Israel and not to be missed. You can book accommodation on line at the South African National Parks website (SAN Parks) or at least check availability for the days you want to be there and lots of good information. We usually phone to confirm the camps/dates we want and then give them our credit card number over the phone. No dramas, ever. Then you're sure to have the itinerary you want. Three nights would be minimum, but it takes at least 5‑6 days to drive from one end to the other! 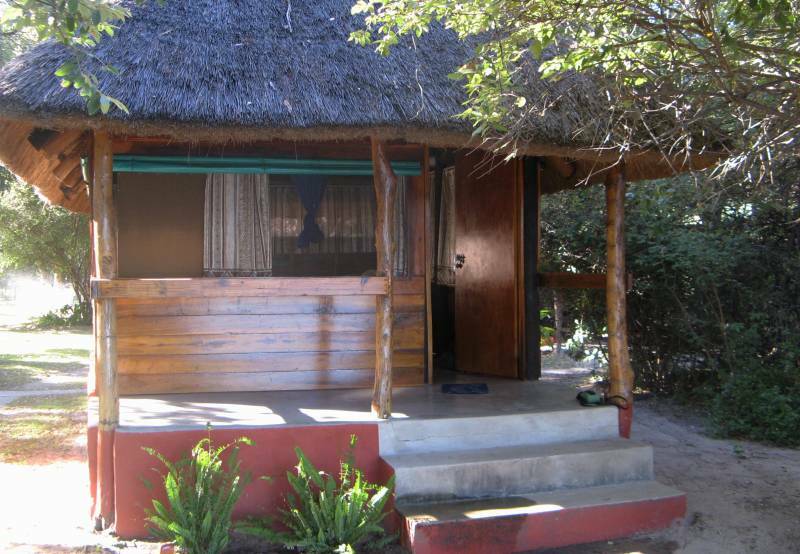 Accommodation is not included in the daily "conservation fee", which as of Jan 2012 was ZAR192 ($24) per person per day. Six days in Kruger offsets the purchase of a year-long Wild Card which was just over R2200 ($275) for a couple (international passport). This card lets you into something like 80 parks throughout South Africa and Swaziland for free. Such a deal! 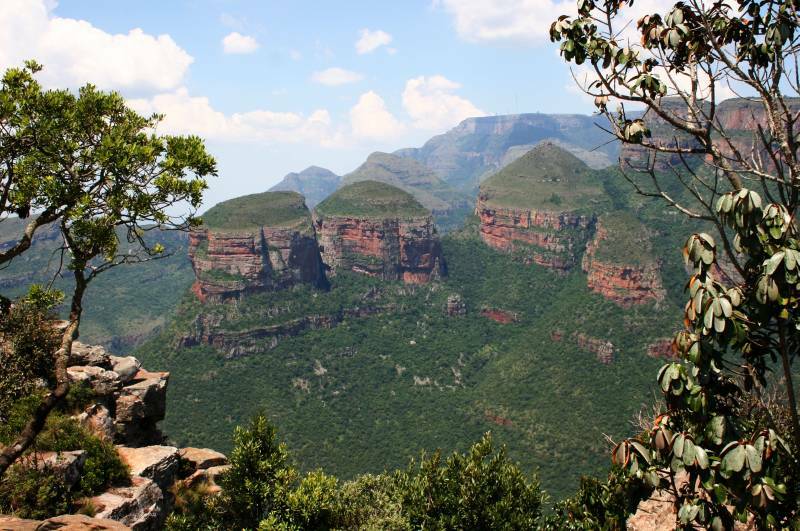 Blyde River Canyon (west of Kruger) is a gorgeous geological place, and you should give yourself at least 2 nights (ie a full day) to enjoy Blyde River Canyon. 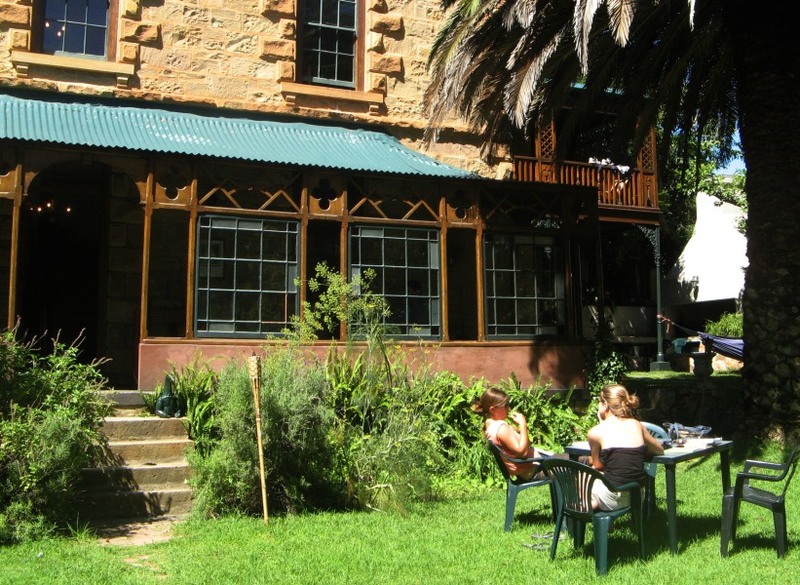 We liked the backpackers in Graskop called Valley View. They have a place to pitch your own tent, or use a pre-erected one. Also nice family rooms (which is what we used, as it rained that night). They're in Coast to Coast (C‑C). In Tzaneen (north) the Satvik Farm is really funky and cool. You stay in old farm workers cottages or camp. We found the staff very friendly. Lovely view and walk down to the dam. 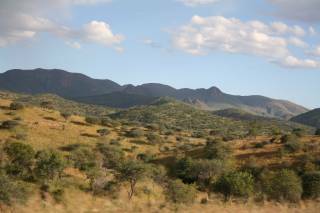 From there you get to drive the beautiful Magoebaskloof (ma‑HOE‑bas‑kloof) towards Polokwane. Polokwane on the N1 north of Pretoria, is a difficult town to drive through if headed west for Botswana. There is no clear "through road" and we have gotten lost there a few times. It's very poorly sign‑posted, but just keep your eyes open for Rte 11 to the west. At one point the big wide road we were on turned into dirt roads in a settlement. Anyway, it's all part of the adventure. 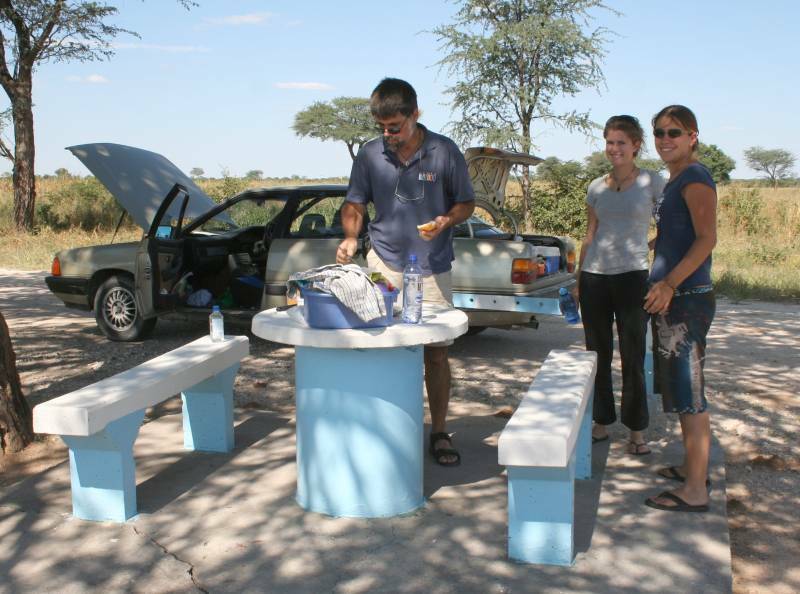 We've not had to stop near Groblersbrug but there are several places a few miles before the border (one on the north side of road called Big Fig Inn, with camping), and once in Botswana at the first petrol station is a new campground called KuaNoKang if needed. It looked pretty nice. This is an easy border crossing with no dramas. The only thing is, we just learned that driving back into SA from Botswana or Swaziland, immigration is no longer giving out 3‑month visas, just 30‑day visas. We received 3 months the first time we came through Martin's Drift back into South Africa, but this last time we had to plead for it. Only when the official saw that someone else at her station had given it, did she also give us one! If your visa has expired while out of South Africa, you can probably get a new 90 day one with no hassles. If you're farther north on the N1 near Louis Trichardt (Makhado), then Ben Lavin Nature Reserve is a nice place to stop. Now run by local villagers. Not a lot of animals and miserable internal roads, but nice people, lovely grassy lawns for camping, etc. Call 072‑593‑4124 or 072‑300‑9868. 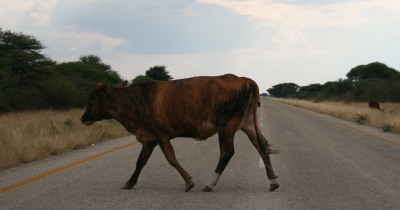 Watch out for slow traffic in Botswana! BOTSWANA: Money in Botswana is PULA (meaning rain). It's usually worth more than the Rand, but more commercial places will accept Rand. The banks in Botswana (Barclays and FNB) only accept VISA at ATMs. We only had M/C so had to do cash advances inside the banks. No charge at Barclays (which are the Visa agents), but R27‑50 fee at FNB (which is supposed to be the M/C agent!). We could use credit card (even MC) at Spar for food and in a pinch, they gave us up to 300P cash back. When you first enter Botswana you have to pay a Road Fund of 20P which is valid all year long. (They give you a paper showing this.) You also have to pay an RTP Road Permit which costs 50P for single entry, or you can ask for a Short-Term Permit which is valid for a round trip (which you'll need if you leave to go into Zimbabwe or Namibia and back to Botswana) which is 90P. Since you probably won't have Pula at the first border, you can pay in dollars or Rand. We found the rand to be a better bargain. BTW when we were there, P1 = R1.3. Some petrol stations take MasterCard/Visa. Just ask first. Petrol was cheaper in Botswana than in South Africa. If you need a place in Palapye, Camp Itumela (492‑0228) comes recommended. They were full when we needed to stop, so we stayed at Palapye Guest House. My preference in the area, though would be to go to Khama Rhino Sanctuary (463‑0713, NW of Palapye) for camping and seeing the rhinos. From there, you have to backtrack to Palapye, as the road to Maun on the west side of the Makgadikgadi Pans is 4WD only. Your next stop heading north needs to be Francistown, as the road from Francistown to Kasane is the WORST and takes about 5 hours. We had a friend of a friend to stay with in Francistown, so no first‑hand experience with accommodation. Lonely Planet shows camping at several hotels on the Tati River in Francistown: Marang (241‑3991) or Tati River Lodge (240‑6000). Note that these are Lonely Planet numbers, so they may have changed. The road to Nata from Francistown is OK in daylight (some potholes). But 50 kilometers north of Nata (and extending for 100 kilometers) the potholes are treacherous. This makes the drive from Francistown to Kasane about 5 hours. In Kasane there are no really nice campgrounds (or very affordable hotels) but we made do at Thebe River Camping (they do have a pool and lawn but camping is on dirt). 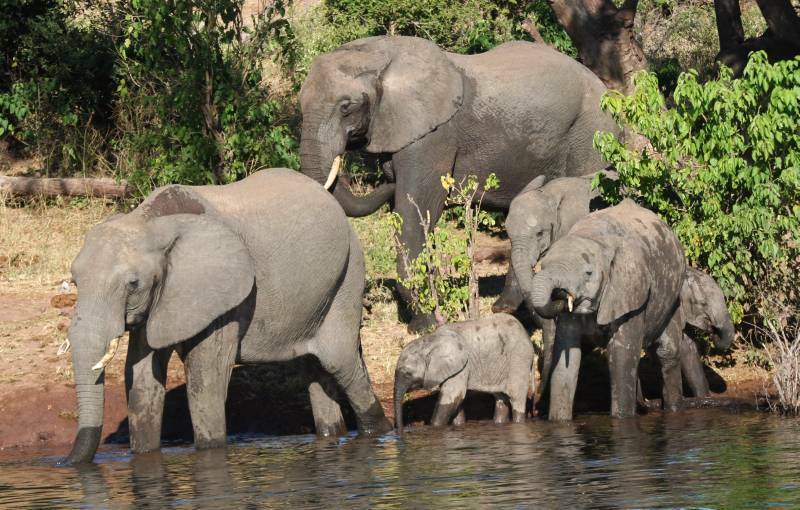 We highly recommend an afternoon boat trip on the Chobe River. The campground can arrange it, but it's pricey. We've twice used a "rasta" in town called Basnes (7163‑0567, email basnesbchi@yahoo.com). 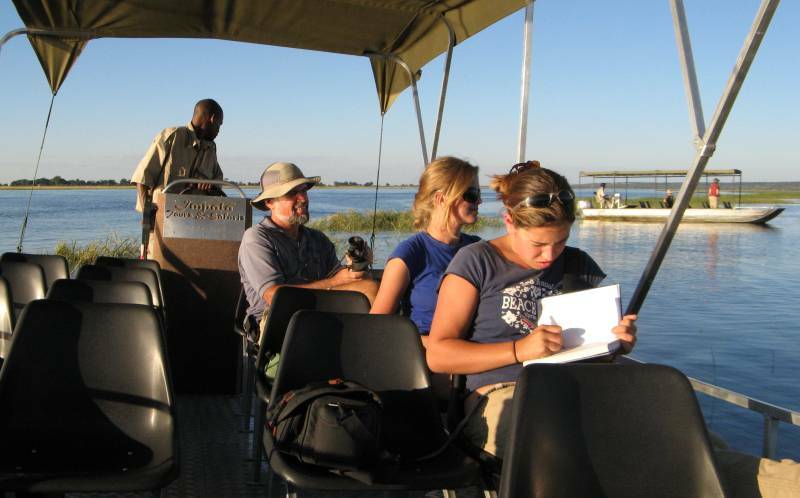 His 3 hour trips are P100/person plus you pay P70/person to enter Chobe NP (~$30 total). Both times we got a boat all to ourselves -- not like being stuffed on a tourist boat with a bunch of folks who've never seen a hippo or croc! Definitely do the afternoon trip (usually starts about 3 or so) as that's when all the elephants come to the river to bathe and the light is glorious. 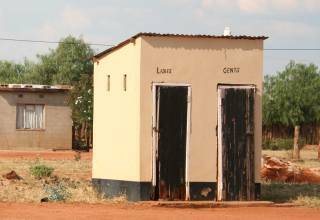 Kasane, by the way, is a small town in Botswana that sits in the corner of 4 countries: Botswana, Zimbabwe, Zambia and Namibia. It is the administrative center for Botswana's Chobe National Park. From here it is less than 100 km to must‑see VICTORIA FALLS. 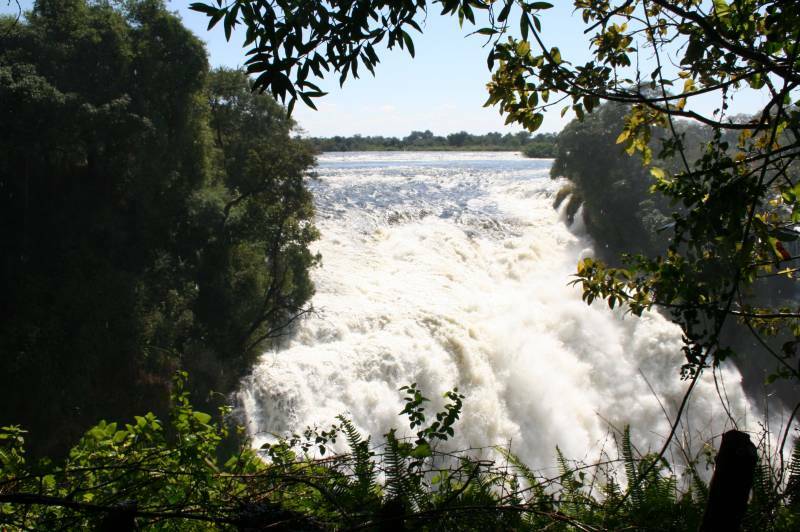 From Kasane, you can take your own car into Zimbabwe to see Vic Falls and get back to Kasane in one easy day, or spend the night at the municipal campground in Zimbabwe. 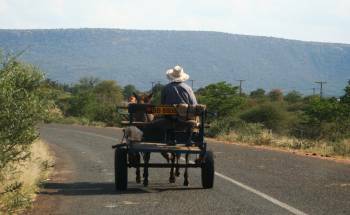 The border to Zimbabwe is a bit congested with day tourists on mini-buses. You pay $30 or R210 per visa. When you enter Zimbabwe there is a "Carbon Tax" on your car, price dependent on the cc's of the engine. Ours was R100 ($12) for 1900cc. There's also Zimbabwe 30 day insurance of about R200 or $25. (Not a cheap day) At Vic Falls National Park the entrance is R150 per person ($16, but better to use rand than dollars here, too). The souvenir sellers are desperate to make sales. Renting raincoats is a very good idea!!! Entrance to the park is payable in any currency except Zimbabwe dollars. We used Rand as it came out a better deal than US$. If you choose to spend the night in Zimbabwe there is camping at the Vic Falls Municipal campground and also at the Victoria Falls Rest Camp (+263 134 0509/11). Our Where to Stay in Namibia lists this place as $10/person. Pay in cash only. Don't even THINK about using a credit card in Zimbabwe! Going into Zimbabwe depends, of course, on the latest news of Mugabe's activities against his opposition. In Africa, it's ALL about tribalism. Mugabe is Shona, and western Zimbabwe is Matabele-land. Mugabe slaughtered ~25,000 Matabele when he first came to power and he knows that they're his main opposition, so that's where his "Death-squads" tended to work at intimidating people into voting for him in 2008. If you're coming back into Botswana from Zimbabwe your road fee and other car import papers are still good (hopefully). Alternatively, from Kasane, Botswana you can visit the Victoria Falls by crossing the Kazungula Ferry into Zambia, but it's expensive. Zambia made us pay US$100 each for 3-year multiple entry visas. There are still car taxes and insurance to pay, but places to stay in Livingstone are more reasonable. Many trucks are backed up waiting to take the (free) ferry - they usually put a single truck on, then whatever cars are waiting, so cars usually get through pretty quickly. The road NE from Livingstone is terrible for a 50km stretch, OK otherwise. Visa fees may have gone up to $200 per person, as we met Americans in Namibia who tried to cross into Zambia from the Caprivi strip (just outside of Katima Mulilo) and that's what they were told. They chose to go to Vic Falls on the Zimbabwe side instead. 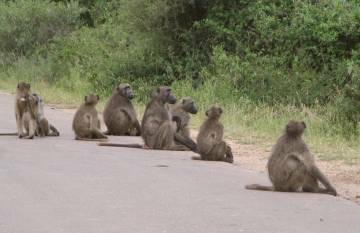 The road through Kasane towards the Namibian border takes you through Chobe National Park on the paved road, and there's no fee to transit. 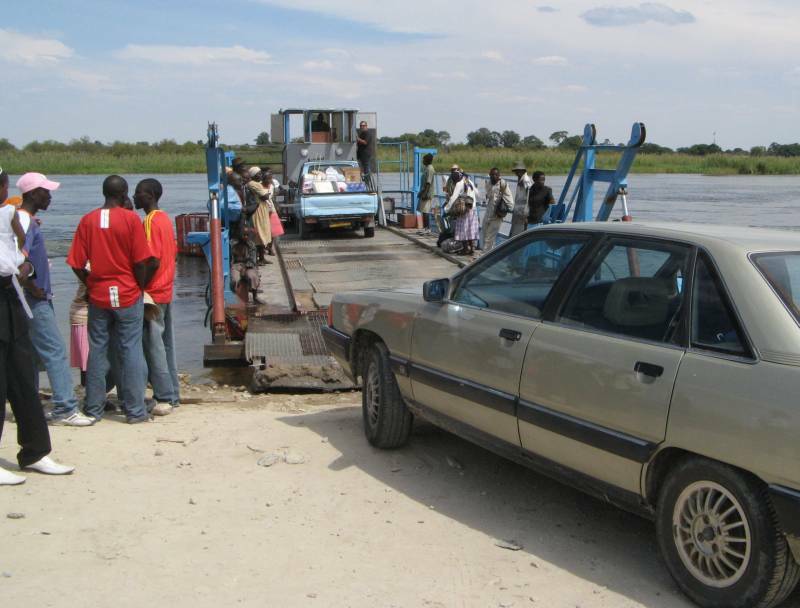 Entering Namibia at the Caprivi Strip at Ngoma should be less hassle than crossing the Zimbabwe border. To enter Namibia you fill out some Immigration forms, then go to the Customs people (next counter) where you pay a Road Fund tax invoice of N$160 ($N1 = R1). You have to pay this every time you enter the country. No discount for multiple. I don't recall any other fees on entering Namibia. I think your South African car insurance is valid, though you don't have to show anything. Nice guest hut at Island View Lodge, beds only. From Kasane (in NE Botswana) you can get to Seronga (where the Okavango's Poler's Trust is) by going south to Nata, west to Maun and taking the road up the west side of the Delta, OR via the Caprivi Strip (Namibia) and back into Botswana at the river. You have more options in a 4X4. 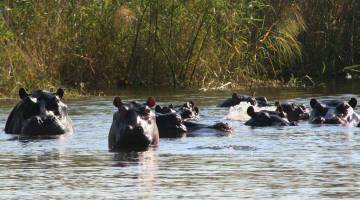 We suggest the Caprivi Strip route, as it's faster, less back tracking, and interesting. Places to stay: Just south of Katima Mulilo, Namibia, is a lovely river lodge/campground/huts called Island View Lodge. Very nice owners. 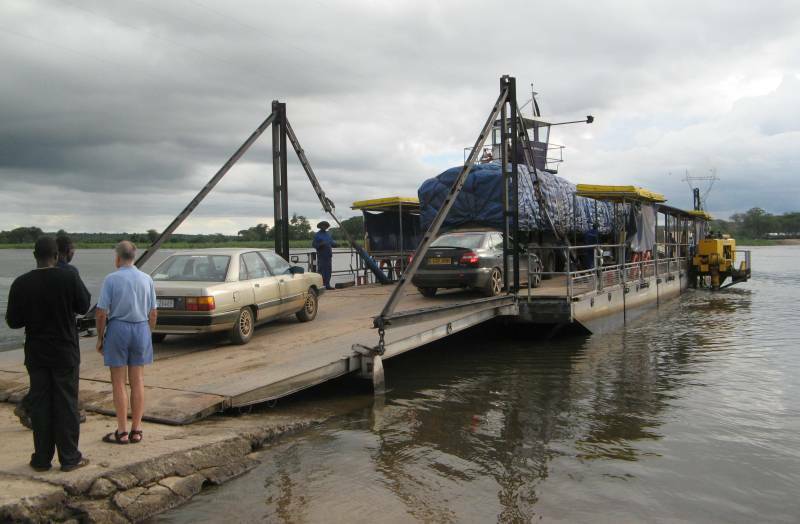 Road was flooded, so they picked us up by boat on the Zambezi. Phone +264 (0) 66 252801. They have self-catering external kitchens, pool, braai area, etc. They take credit cards. 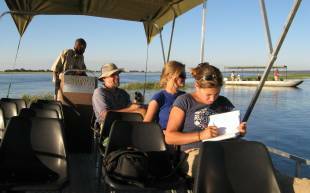 Also listed in the book is Caprivi River Lodge 5 kilometers from Katima Mulilo with camping. Phone+264 (0)66 252288. Once in Nambia's Caprivi Strip drive 332 kilometers west on the B8 (we figure B stands for Bitumen) to Divundu/Bagani. (There are shaded picnic tables along the road.) From there, you turn south towards Botswana. It's 32 kilometers to the border, but before the border is a gate for the entrance to Mahango National Park. This park has southern Africa's largest herd of Sable antelope. We only caught a glimpse of them, but you might be luckier. There's no charge to take the paved road straight to the border, only a fee if you want to take the 2WD-OK dirt river road. We paid the fee (about $N30pp) so that we culd get to the river banks. It was well worth it! Most of the park is 4WD only, so you don't have much choice. It was a lovely 1.5 hour drive along the Okavango River banks and inland to the Namibia/Botswana border. The park is home to many species of antelope besides the sable, and the bird sightings were awesome: ground hornbills (which are endangered), bee eaters, birds of prey, and water fowl. OKAVANGO DELTA TRIP out of Seronga: Enter Botswana again from the Caprivi Strip and turn left right away for the ferry. This is free, and runs continuously. Very African. They take a couple cars and a truck or so. After the ferry begins your 120 km dirt/sand road to Seronga. Just take it easy! Nice views of the river at some places. Nice villages. You'll see signs for OPT (Okavango Poler's trust) as you enter Seronga which is also sign-posted.) 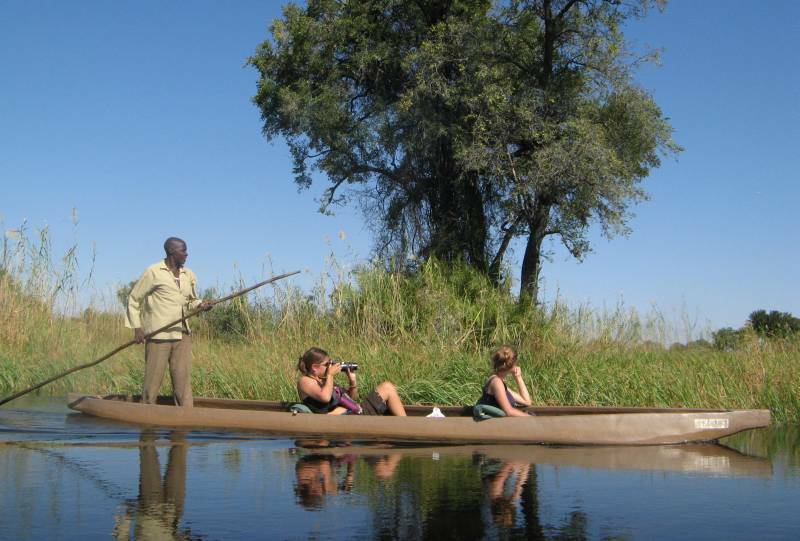 RESERVATIONS for the Okavango: Call +267 687 6861. Madugah speaks the best English, but she's not always there. You'll need reservations for both the night before your Makoro trip and the night you come back, as they return at 3-4 pm and you can't drive that dirt road in the dark! We stayed in the hut, which they gave us at camping fee because we were off season (April). Camping is P55pp/night, both at the OPT camp and in the delta. We totally suggest 3 days, 2 nights. The makoros cost P500 for the first day and P400 for each additional day. Each makoro carries 2 people (plus the local poler). There were no other fees except whatever you wish to tip your 2 guides/polers. But here's the trick. You MUST pay in cash! There's no facility for credit cards and no ATM in Seronga (not much electricity either!) We got stuck (misinformation!) and had to be trusted to pay the bank in Shakawe on our way out after the trip. They post the exchange rates they give for dollars, Euros and Rand, and they're all bad. (especially the Euro which is unfortunately what we had to use for tips for the guides). So BE SURE TO GET ENOUGH PULA AT AN ATM IN FRANCISTOWN before you leave there! Also get all your FOOD in Francistown or Windhoek for the makoro trip, which ever way you arrive from! The makoros are fiberglass and therefore fairly leak-proof. OPT provides nice mattresses both to sit on in the makoros and to sleep on at night. They pack a tight makoro for you, with luggage as back rests. You have to take all your food for the trip, but the guides have their own. They are happy to have any left-overs you have, or snacks, of course. The guides will build the fires and tend them all night. We moved camp both nights. Some people stay at one place 2 nights, but we had more fun seeing more islands. Ask about bathing in the river in the afternoon. Never get in without permission!! Hippos and crocs! We took a 5 liter bottle of water. They say to boil your water, but then it tastes like smoke. You might want more. We also took our own 4 water bottles, but had to fill them with boiled water, yuck. During the day we drank from the Delta through water lily straws, but when you camp the water is stirred up and not drinkable. You could be brave and drink only river water filling water bottles while in the makoro. We had no GI problems. (tough yachtie tummies!) Instant soup was really nice before dinner and Milo after dinner and in the chilly AM. They let us take our cooler which wasn't kept cool as much as a good storage place for food. You need long pants, socks and sneakers for the walks as the grass is prickly and tall. (OPT does tell you all this.) The makoros don't get wet unless someone does something stupid. We had the good big camera out all the time at our feet, ready to shoot. Enjoy! Poling slowly through the Okavango. Awesome! Backing up a bit - the drive from Katima Mulilo to Seronga is a LONG day. The dirt road (about 120 kilometers) will take at least 2 hours. It starts rough but gets better towards Seronga. I suggest stopping at Mahango National Park on the Namibian side of the border, but you may want to do it on the return after the Okavango if you're going back into Caprivi and on to Etosha. If you do Mahango going north, you can relax and enjoy it, then stay the night nearby in Ngepi Camp near Divundu/Bagani on the D (for dirt?) 3403 south of Divundu (main road to the border). It's in the Lonely Planet. It's on the river, with a caged swimming pool to keep crocs and hippos out. Very cool. We stayed in safari tents as we got there late in the evening, but there is nice grass for camping. They cater to the overland truck crowd, so call ahead to be sure there's camping space. Lovely outdoor bar/restaurant, eating area (on overturned old wooden makoros) right on the river, and a nice braai area. Phone +264 (0)66 259 903. They do 4WD trips into Mahango which we didn't do, but might be fabulous as its the best chance to see those elusive and magnificent sable and roan antelopes. From Ngepi, it's a long haul west on the Caprivi Strip through Tsumeb to Etosha. It's silly to arrive at Etosha in the late afternoon as you pay per day. (Etosha's daily fees are for 24 hours: so if you enter at 7AM and leave the last day after 7AM, you have to pay for another day.) We didn't have time to stop in Tsumeb as we'd planned. 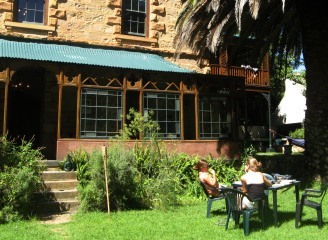 We had reservations at Mousebird Backpackers (264 221 777). They have camping. If you have time and want some cultural stuff, we heard about Muramba Bushman Trails farm (264 220 659) which is 70 km NE of Tsumeb. It aims to educate about culture, traditions and pharmacopoeia of Bushmen. They do guided morning walks. Don't know if there's camping as the book only lists accommodation at $14pp in beehive huts/thatched chalets. 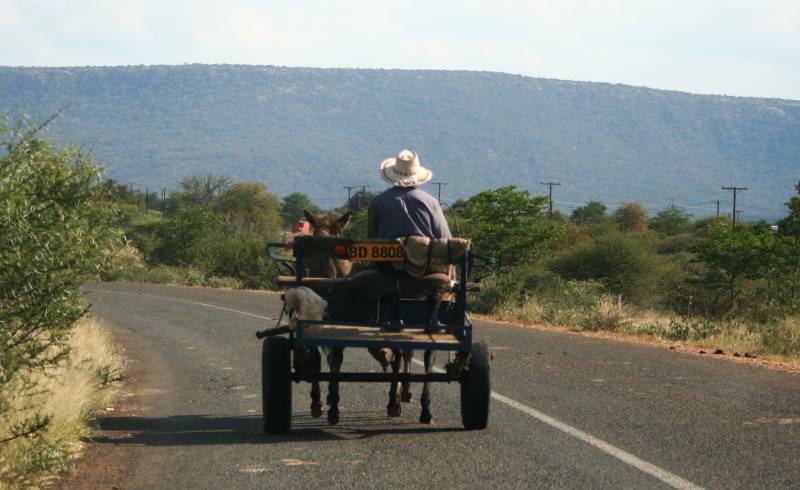 Take the Tsintsabis road north from Tsumeb for 64 km, then east on D3016 for 6 km to the farm. MUST call ahead. 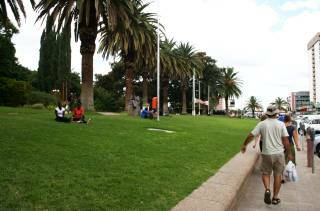 On our 2008 trip we actually looped from Botswana through Maun, across 900 km of Kalahari desert to Windhoek, Namibia, then went north to ETOSHA NATIONAL PARK : By going to Windhoek first we paid all our gate passes and camping reservations in the city at the central office. This isn't necessary, as you can arrange everything at the park itself. If you don't want huts, there is almost always camping room, and you'll have to take potluck when you arrive. All three rest camps are nice, and each have lit, all-night water holes you can walk to with benches for viewing the nocturnal animals - the one at the western camp was the best, even during the day. Very cool. The biggest shock is the price: US$25pp/night to camp! Ouch. You would expect super nice camping for that, but the set-up is only so-so. Some sites have concrete tables/benches. There are braai pits but you need your own charcoal/wood. The ablution blocks are ok but not nearly as nice as at Kruger. There are swimming pools, but we never had time to enjoy them -- we were up and out at dawn each day and back at sunset! There are a few "get out of your car" toilet and picnic areas in the park for lunch, etc. NOTE: For Kruger we enjoyed having a picnic lunch at one of the many Hides, rather than the picnic grounds (which usually have no view). 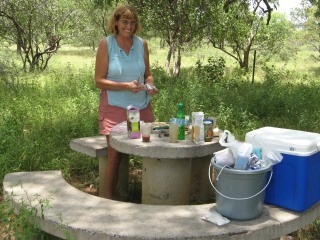 In Etosha, lunch at the water-hole for the western camp was very nice. When we were there (April) the Pan was still filled with water and the animals very dispersed. The main concentrations were in the western part of the park (not the far west, which is open only to tour groups), north and around Okaukuejo Camp. 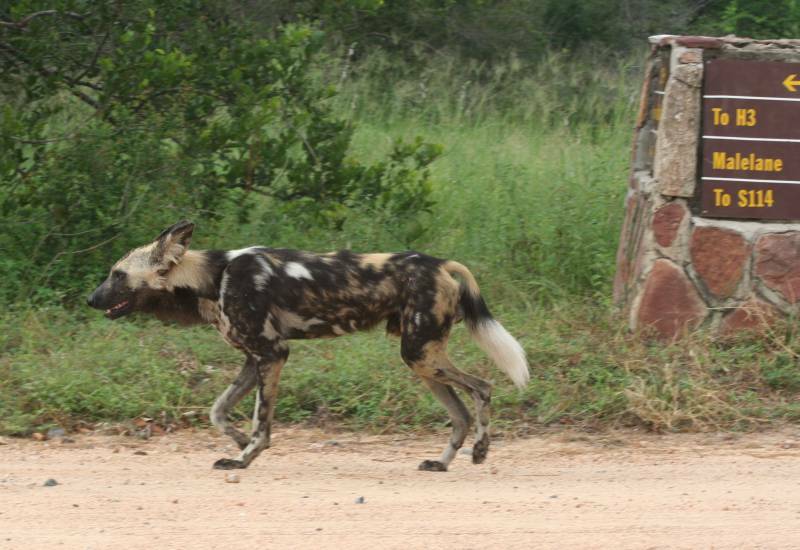 (BTW look for rare black faced impala in that area.) But in winter (the drier season) they should be everywhere. The fewest animals (as in 1 gemsbok & 1 rhino) were north of Namutoni. Chudup Watering Hole was fabulous, but others had no animals. The savannas between Halali and Okaukuejo were wonderful. You never know what you'll see, where! We could pay for accommodation with credit card, but petrol and gate fees were paid in cash only. Again, R1 = N$1. Gate passes are $N80pp/day, plus some misc $N10 + 10 car fee. There are ATMs in the park if you need. The "tourist shops" in the camps are nothing compared to Kruger's so bring in everything you'll need food-wise. There is a restaurant at each camp, but we never ate at them. You'll want to buy wildlife guides to the park available at the tourist shop in Namutoni. One has maps, (essential) and one has info on the watering holes -- their history, what is likely to be seen there and when. Very cool. South of Etosha: Assuming you're leaving the park to the south of Okaukuejo there is a nice campground a few kilometers south of the park. 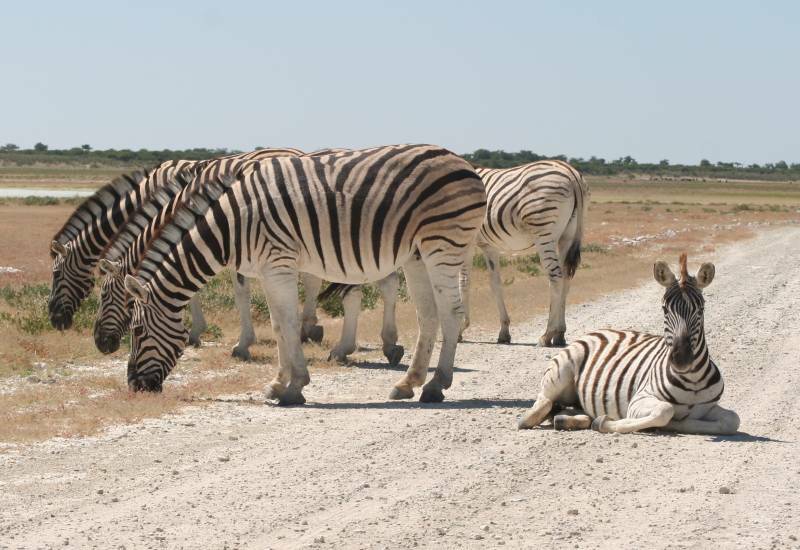 It's 10 km south of Anderson gate (meaning you could spend your last full day in Etosha till dusk, then drive 10 km south to sleep.) Called Etosha Safari Camp, it has a grassy area for tents, swimming pool, restaurant, ablution blocks and braai areas. As with elsewhere, you need your own wood/charcoal. 264 (0)61 230 066. Camping was $N50pp. Dinner was N$100/p for a nice buffet. The road to Windhoek is in good condition and fast. Staying in Windhoek is tricky -- almost everything in Lonely Planet is either closed or way higher prices, so there are not a lot of choices. 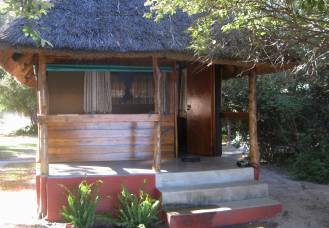 Call ahead to the nicest (and least expensive) place we saw -- Chameleon Backpackers and Guest House on Voight Street +2646 124 4347. They called around for us as they were full -- Cardboard Box was 2nd choice, (also full), and we ended up at Backpackers Unite -- one of the least nice backpacker places we've been. Oh well. Only 12 km outside of town Daan Viljoen Park is lovely for camping and walking (no predators) in the scrub hills with wildlife (+26 461 285 7200). We stayed there in 1980! Windhoek is a lovely African town. If you are going into other parks in Namibia you'll want to visit the Namibia Wildlife Resorts office, which is NOT in the Oode Voorpost building anymore (as per Lonely Planet) but on the main drag, Independence Ave in the Sanlam Building, across from Zoo Park. [We hear that it has moved again, and is now on the walking mall in town.] Very helpful and informative (but you can see where your fees go, and it's not the animals...). Be sure to pick up a free Namibia Travel Guide at the parks office called Where To Stay. It has tons of info and a good mix of affordable and outrageous accommodation listings/ads. There's lots of great stuff to see in Namibia as you go south, all far more scenic than the drive back through central Botswana which is much the same mile after long hot mile. There is nothing to see in Maun, or on the road to Gaborone. Jon and I spent a month in Namibia in 1980, falling in love with it. Here are some highlights you could hit: We highly recommend the Damaraland Brandberg mountains with cave paintings, such as the famous White Lady (Wit Frau) painting. There is camping (per recent books) in the area of the Petrified forest and Brandberg at Aba Huab Camp north of the Twyfelfontein turn off. Tel: 064 697 981. You may need your own water here. Very basic. From Anderson Gate (Etosha) go south to Outjo, then take the C39 west to Khorixas and on west to Brandberg. (You need good maps). The coast is fascinating (and cold!! 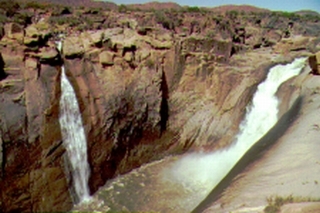 ), but don't overlook the wonders of the red desert around Spitzkoppe area and the Pondoks (granite outcroppings) with camping in the Pondoks and hiking up to Bushman's Paradise rocks. Awesome! Community-run 064 530 879. There's a small charge to enter the Spitzkoppe area as well. This Brandberg area is filled with animals (like gemsbok and ostrich) that live outside any parks boundaries. Very wild and beautiful. Don't be surprised to be raced by an ostrich! You can drive out to Swakopmund and Walvis Bay, then south on the C14 and C19 towards Sesriem and Sussuvlei, the sand dune area. This is touted as Namibia's #1 tourist attraction but I'd rate it a poor follow-up to many other places. Yes, high red dunes and gorgeous sunsets and killer hot hikes -- you can stay here at US$100/night, or be lucky and get a camp site for less. There is a campground at Sesriem which you either take potluck on a site standby after 5PM or you may need to book in Windhoek at the parks office ahead. No other affordable places. Continuing south there is a choice: Do you enter South Africa at Rietfontein (east of Keetmanshoop) to go to the wonderful wildlife-full Kalahari Gemsbok National Park (now called Kgalagadi Transfrontier park), or stay in Namibia and visit the stunning Fish River Canyon? The latter is a desert, mini-version of the Grand Canyon. We hiked to the bottom in 1980, but it is only safe (and open to hikers) during the dry season (flash floods being a danger). 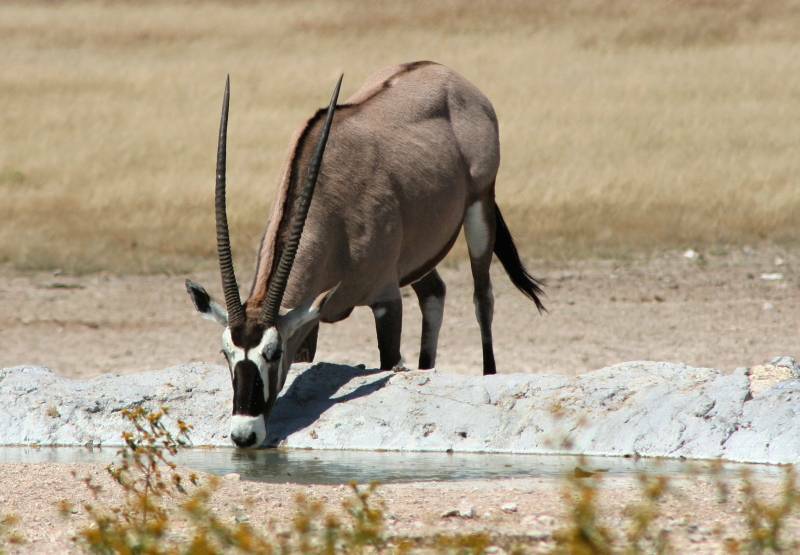 We loved the Kalahari Gemsbok park for its cheetahs, eland, and MANY lions. There is camping at many places (see SAN Parks). You don't have to go into the Botswana part of the park (can't without a 4WD). There's lots to see on the South African side. From either Fish River Canyon or Kgalagadi we recommend Augrabies Falls National Park. (Also part of SAN Parks so there's camping etc). We camped and then did the 3-day Klipspringer trail, or there's a great 3-hour hike on the Dassie trail. Blue water falling over orange rock and sandstone with green river banks, sand flats, stark sandstone. Beautiful. The Cape: Back in South Africa, there are so many choices: Kimberley is a great place for a day of history at The Big Hole (diamonds!) and the Kimberley Mine Museum. Very well done. Diamonds are found in volcanic plugs, and the Kimberly Big Hole is an old plug (set in a flat desert). The Karoo National Park, Addo Elephant Park, Mountain Zebra national Park, the whole Garden Route are all fantastic. 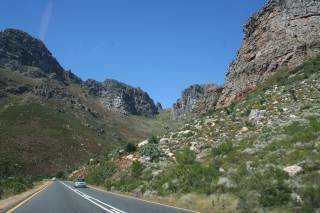 Heading for Knysna via Prince Albert and the (old road) awesome Swartberg Pass into Oudtshoorn is amazing. Dirt road and steep in places, but stunning scenery with elaborately folded red sedimentary rock. They were working on a bridge and had signs up about road closed when we were there, but it was actually easy to drive around their work. And then there's all the Cape!! Allow at least a week in this most magnificent area. That gives you time to drive Chapman's Peak Drive, one of the most scenic coastal roads in the world, over the beaches and crashing blue ocean. You can explore the fabulous plants and animals of Cape Point National Park (now called collective table Mountain national Park). It's a must-do for anyone who loves plants and/or gardening to visit the world famous Kirstenbosch Gardens. Even if you aren't a plant fundi, you can't help but admire the sometimes intricate, sometime gaudy flowers of the many species of Protea that grow there. For walkers, there are miles and miles of trails up on the slopes and top of Table Mountain (no need to climb up, there's a cable car!) Or on the sunny slopes above Simonstown. Also in Simonstown are the fabulous Cape Penguins, aka Jackass Penguins for the braying sound they make. For road trips in the area, the wine country is a must-see, as are the passes leading into and out of the Cape: the Hex river Canyon and the Du Toits Kloof Pass road. Take the old road, not the one that goes through the tunnel, for a real treat. Go for it! And look forward to weeks and weeks of travel fun!